Bucharest Forum / Healthcare, now at its fifth edition, continues the efforts of the platform developed by Aspen Institute Romania, in support of a deeper long-term dialogue between the public and private sectors and industry, on the topic of health sector reform. 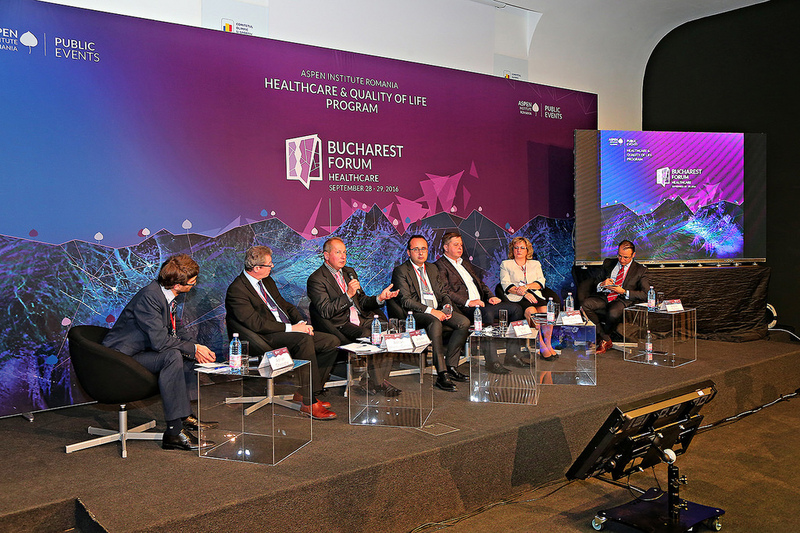 The Bucharest Forum / Healthcare platform is part of Aspen Institute Romania’s Healthcare & Quality of Life program, bringing together experts from both the public/decision-making environment and from the industrial sector. The program draws inspiration from Aspen Institute USA’s 25-year experience and expertise in carrying out specific programs and a sector-wide, innovative dialogue on healthcare. Bucharest Forum / Healthcare has taken place each year since 2013 and has ever since enjoyed substantial attention and visibility from the public, authorities, industry and media. The Forum brings together renowned specialists from the medical sector, decision-makers, European and national experts in the fields of healthcare, health technology and the pharmaceutical sector, representatives of academia and researchers, as well as business leaders engaged in developing health policies. Participation to the Forum is based on nominal invitation. Scientific advancements outline a path towards ‘personalized medicine, a targeted approach to the prevention, diagnosis and treatment of disease based on an individual’s specific genetic profile. In fact, in recent years therapeutic alternatives based on the study of genetic profiles have been developed, but use of genetic data to inform medical decisions is still lagging behind. The panel explores critical questions and possible methodologies for evidence-based policy making. Bridging health economics, ethics, governance issues and stakeholder engagement requires a new set of policy responses. The growing availability of highly effective treatments for infections is limited by the cost of new agents. One dimension of the discussion is related to the selection of treatment regimens. In the case of patients with infections, this should take into consideration efficacy, duration and adverse effects, the profile of the regimen, potential drug interactions, prior patient history and the stage of the illness. For individual patients, the financial component represents an important dimension to be considered. In Romania and the rest of Europe, healthcare budgets, both public and private, are coming under increasing pressure due to demographical patterns and financial difficulties, while the medical needs are growing and diversifying. This raises the problem of reforming the financing of the healthcare sector in order to make it more sustainable and able to meet the challenges of an ageing population. The goal is to achieve low costs and full consumer choice of providers and quality of care, for instance by means of combining universal medical savings accounts with supplementary programs to protect vulnerable patient categories. The panel explores the relationship between sports, performance and quality of life. A society’s adaptive and transformative capacities are key to its long-term well-being and particularly to the quality of life of its people, whether measured in access to public health and utilities services, infrastructure or transportation. Innovative ways to build social resilience, either at the level of local communities or in large urban centers require a mix of policy design instruments and cross-sector information campaigns and research. One dimension of these platforms relates to internet-based analytics platforms designed to reveal health risk factors worldwide. Quantifying health – related devices and technologies are transforming management processes of symptoms and stress tests, helping identify and tackle diseases’ causes and assisting medical staff with follow-on health procedures. The panel explores the relationship between sports, performance and quality of life. A society’s adaptive and transformative capacities are key to its long-term wellbeing and particularly to the quality of life of its people, whether measured in access to public health and utilities services, infrastructure or transportation. Innovative ways to build social resilience, either at the level of local communities or in large urban centers require a mix of policy design instruments and cross-sector information campaigns and research. One dimension of these platforms relates to internet-based analytics platforms designed to reveal health risk factors worldwide. Quantifying health – related devices and technologies are transforming management processes of symptoms and stress tests, helping identify and tackle diseases’causes and assisting medical staff with follow-on health procedures.